Churches and individual Christians typically have faulty assumptions about the causes of poverty, resulting in the use of strategies that do considerable harm to poor people and themselves. Don’t let this happen to you, your ministry or ministries you help fund! 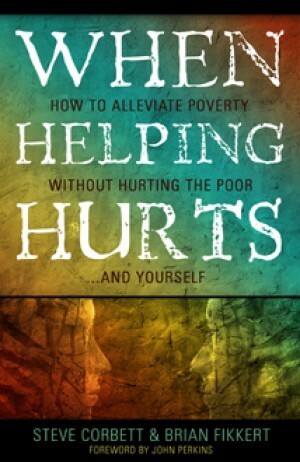 A must read for anyone who works with the poor or in missions, When Helping Hurts provides foundational concepts, clearly articulated general principles and relevant applications. The result is an effective and holistic ministry to the poor, not a truncated gospel.”Initial thoughts” at the beginning of chapters and “reflection questions and excercises” at the end of chapters assist greatly in learning and applying the material. A situation is assessed for whether relief, rehabilitation, or development is the best response to a situation. Efforts are characterized by an “asset based” approach rather than a “needs based” approach. Short term mission efforts are addressed and economic development strategies appropriate for North American and international contexts are presented, including microenterprise development. Now with a new chapter to assist in the next steps of applying the book’s principles to your situation.